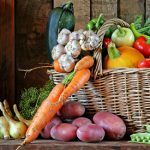 Vegetarians enjoy some impressive health advantages, including reduced risk of chronic diseases, particularly heart disease and type 2 diabetes, less overweight and obesity, and greater longevity. However, becoming vegetarian does not guarantee a healthful diet. It is entirely possible to completely blow it on a vegetarian diet. After all, chips and soda are generally 100 percent vegetarian, as are many other fatty, salt- and sugar-laden junk foods. This column will review six of the most common stumbling blocks for vegetarians and how we can be sure to avoid them. 1. Switching from meat and potatoes to pasta and bagels. The most common blunder made by new vegetarians is switching from meat and potatoes to pasta and bagels. While it is true that pasta and bagels are familiar, tasty foods, they are no nutritional bargain. Pasta, bagels and other white flour products are refined carbohydrates. Whenever refined carbohydrates become dietary staples, they contribute to overweight, heart disease, type 2 diabetes and gastro-intestinal disorders. Carbohydrates, per say, are not the problem. In fact, the lowest rates of chronic disease in the world are in areas with high carbohydrate intakes. However, in these protective high carbohydrate diets, the carbohydrates come from whole plant foods, such as vegetables, legumes, grains, fruits, nuts and seeds. These foods come packaged with such protectors as fiber, phytochemicals, phytosterols, vitamins, minerals and essential fatty acids. To avoid this common stumbling block, simply replace meat and potatoes with beans and greens. Rely on whole plant foods for carbohydrates. Minimize use of refined flour products. 2. Replacing meat with dairy and eggs. Often new vegetarians trade in meat, chicken and fish for dairy products (mainly cheese) and eggs. Typical entrees include pizza, lasagna, macaroni and cheese, grilled cheese sandwiches, cheese omelets and quince. The nutrition challenge that arises is getting a sufficient supply of iron. Iron comes in two different forms in food: heme and non-heme. Heme iron comes from blood and is generally found only in meat, poultry and fish (about 40 percent of the iron in animal flesh is heme iron). This type of iron has high bioavailability. Non-heme iron is found in meat, as well as all other iron-containing foods. Dairy products are poor sources of iron and they inhibit iron absorption. The iron in eggs has poor bioavailability. Thus, when vegetarians replace meat (which contains significant amounts of bioavailable iron) with dairy and eggs, the consequence may be reduced iron status. To avoid this problem, vegetarians are well-advised to replace meat with good plant sources of iron, such as legumes. Other good iron sources include nuts and seeds (especially pine nuts and pumpkin seeds), dried fruits, blackstrap molasses, some vegetables (greens, mushrooms and peas) and grains (especially quinoa, amaranth and iron-fortified grains). Eat such vitamin C-rich foods as fruits and vegetables with iron rich foods to enhance iron absorption. Avoid sprinkling wheat bran on foods as it is concentrated in phytates, which significantly reduce iron absorption. 3. Consuming trans fatty acids. Trans fatty acids are unsaturated fats that have been turned from liquid oils to solid fats, primarily by the process of hydrogenation. From a health perspective, trans fatty acids are a disaster. These fats become incorporated into cell membranes, changing their shape, flexibility and permeability. They effectively dumb cells down, impairing their function. About 90 percent of trans fats come from partially-hydrogenated fats in processed and fried foods. Our most concentrated sources are margarine, shortening, crackers, cookies, granola bars, baked goods, chips, snack foods and deep-fried foods. The World Health Organization (WHO) recommends that less than 1 percent of calories come from trans fatty acids. For a person consuming 2,000 kcal per day, that’s about 2 grams, or about half of what you would get in a single donut or medium order of fries. Trans fatty acid intake depends almost completely on the amount of processed and fried foods consumed, so vegetarians can easily consume as much as non-vegetarians. To avoid trans fatty acids, read labels and avoid anything with partially-hydrogenated vegetable oils or shortening. 4. Assuming that all nutrients will be provided by nature. While this is true in theory, it is not true in practice. All nutrients are available in nature; however, due to our manner of living, several nutrients have become difficult to acquire in certain situations. For vegetarians, vitamin B12 is a good example of a nutrient that is plentiful in nature, but not so plentiful in the foods we eat. Vitamin B12 is a nutrient that is produced mainly by bacteria. It is present in anything contaminated with B12-producing bacteria. While animal products are reliable sources of B12, plant foods are not. This is because we remove B12-producing bacteria in an effort to minimize pathogenic bacteria. Vegetarians have reduced B12 status relative to omnivores, and vegans have the lowest levels of all groups. Lack of vitamin B12 in the diet causes megaloblastic anemia, nerve damage, gastrointestinal disturbances and elevated homocysteine. The elevated homocysteine can potentially eliminate any cardioprotective effects of a vegetarian diet. Reliable sources of vitamin B12 for vegetarians include fortified foods (Red Star Vegetarian Support Formula nutritional yeast, cereals, non-dairy beverages, meat analogs, etc. ), supplements, and animal products (dairy and eggs) for lacto-ovo vegetarians less than 50 years of age. Animal products are not considered a reliable source of vitamin B12 for those over 50 years of age as the ability to cleave B12 from the protein it is bound to can be significantly impaired. To get sufficient vitamin B12 from foods or supplements, we need at least 3 mcg in fortified foods in two or more meals, 10 mcg of supplemental B12 daily or 1,000 to 2,000 mcg of B12 weekly. Seaweed, fermented foods and organic vegetables are not reliable sources of vitamin B12. 5. Getting insufficient omega-3 fatty acids. While vegetarian diets are generally lower in total fat, saturated fat and cholesterol than are nonvegetarian diets, they generally offer no advantages over nonvegetarian eating patterns where omega-3 fatty acids are concerned. This is partly because vegetarians do not eat fish, the most concentrated omega-3 source in the omnivorous diet. Total omega-3 requirements may be higher for vegetarians than for nonvegetarians, as vegetarians must convert plant omega-3 fatty acids to the more physiologically active long-chain omega-3 fatty acids found in fish. Thus vegetarians are well-advised to include at least 1.25 percent of calories as omega-3 fatty acids, or approximately 3 to 5 grams per day. The best sources of omega-3 fatty acids in the plant kingdom include flaxseed and flaxseed oil, hempseed and hempseed oil, chia seed and chia seed oil, canola oil, walnuts, dark greens and wheat germ. One tablespoon of ground flaxseed provides about 2.6 grams of omega-3 fatty acids and or 1 teaspoon of flaxseed oil provides about 2.7 grams. Lacto-ovo vegetarians can get some long-chain omega-3 fatty acids from omega-3 rich eggs, and both vegetarians and vegans can get long-chain omega-3 fatty acids from cultured microalgae (available in veggie caps). Pregnant and lactating women may be well-advised to consider a direct source of long-chain omega-3 fatty acids. Many people assume that becoming vegetarian will protect them from overweight and obesity. While it is true that vegetarians and especially vegans tend to be leaner than their omnivorous counterparts, a vegetarian diet does not guarantee a lean body. A healthful diet and lifestyle results in a healthy body weight and many people who shift to a vegetarian diet do improve their diet and lifestyle choices, but not always. For some people the switch to vegetarian means a double order of fries instead of a burger and fries. Overeating and under-activity leads to overweight and obesity, and vegetarians, like most Americans, have plenty of opportunity to overeat. Of course, the concern is that overweight and obesity could effectively cancel out many of the health benefits that commonly result from a vegetarian diet. Being overweight increases risk for heart disease, type 2 diabetes, certain types of cancer, osteoarthritis, gallbladder disease, gout and sleep apnea. Obesity has been found to add about 20 years to a person’s age in terms of health risk. Portion control is of the utmost importance. While it is easier to overeat when deep-fried foods, salty snacks, white flour products and soda are at the core of the diet, it is also possible to overeat such healthful foods as fruit smoothies and homemade whole grain bread. To avoid overeating, limit processed foods and added fats. Limit calorie-laden beverages. Focus on high-fiber, whole plant foods. Be mindful of what you consume. Eat slowly. Include at least 30 to 60 minutes of physical activity each day.